Fresh baby ginger (and its rhizome cousin, tumeric) at Chas Gill’s Kennebec Flower Farm stand at the Brunswick Farmers’ Market in early October (all photos by Laura McCandlish, unless otherwise noted). I had never cooked with fresh, baby ginger before. I remember seeing local ginger once in Oregon, at the Eugene Farmers’ Market, at the Groundworks Organics booth, I believe. But Maine is not Oregon. Artichokes, and even citrus such as Meyers Lemons, are relatively easy to grow in temperate Oregon. It rarely snows during the Willamette Valley’s mild winters. In Oregon, the garlic seed sends up green shoots by November, vegetation that reminds you spring is coming throughout the wet, grey winter. But in Maine, the fall-planted garlic doesn’t poke up until April or May. 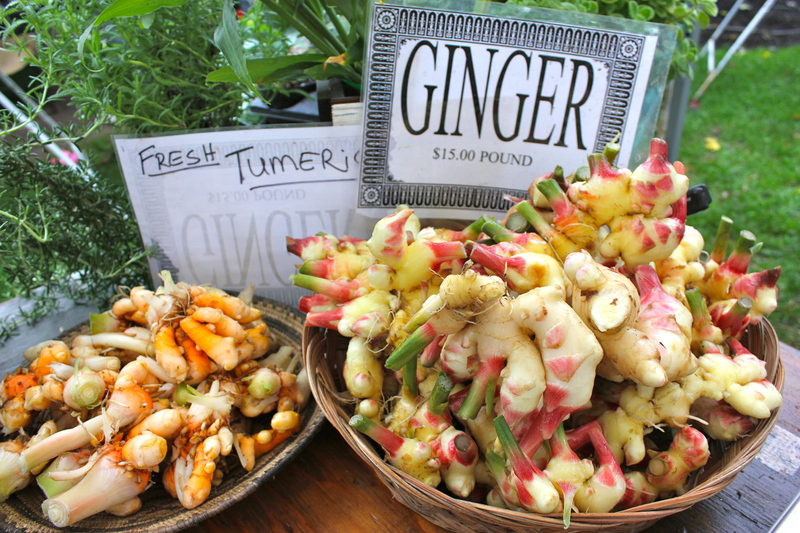 So I was more than a little surprised to chance upon locally-grown ginger at the farmers’ market in this harsh clime. At least half a dozen farmers in Maine are growing the niche crop in their unheated, underutilized greenhouses throughout the summer. Leading ginger producer Freedom Farm will speak on a panel about “New Crops [winter-sprouting broccoli, raspberries and ginger] in Tunnels” at MOFGA’s upcoming Farmer-to Farmer conference this weekend. 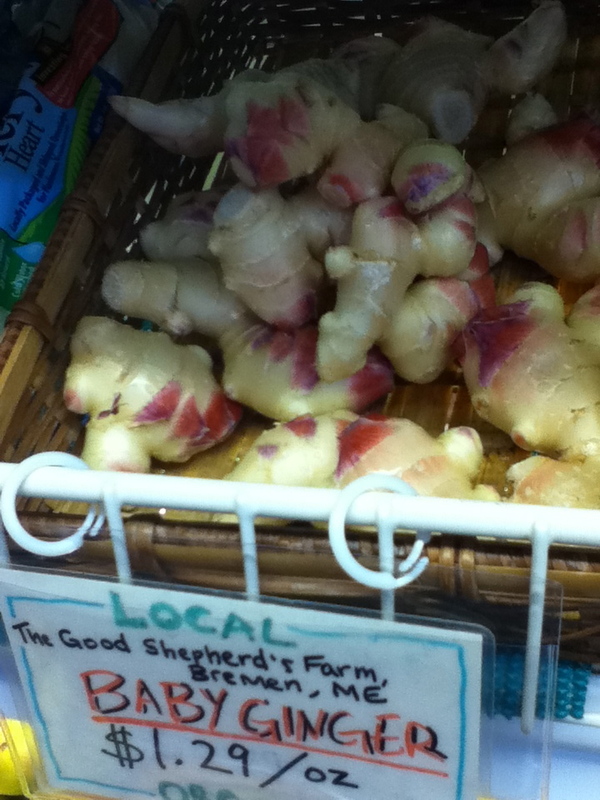 The Maine-grown ginger I first chanced upon at Morning Glory Natural Foods in Brunswick. I first chanced upon ginger at Morning Glory Natural Foods in Brunswick. It was from the Koubek family of The Good Shepherd’s Farm in Bremen, which planted the rhizomes for the first time this season. The Koubeks also supplied Chef Aaron Park (who grew up in Eugene, Ore.!) of Henry and Marty Restaurant here. Park, whose sister lives in Corvallis, pickled the rosy young ginger into the Japanese sushi condiment, gari. He also shaved it over ocean perch and grated it into a beef short rib marinade for Korean kalbi. 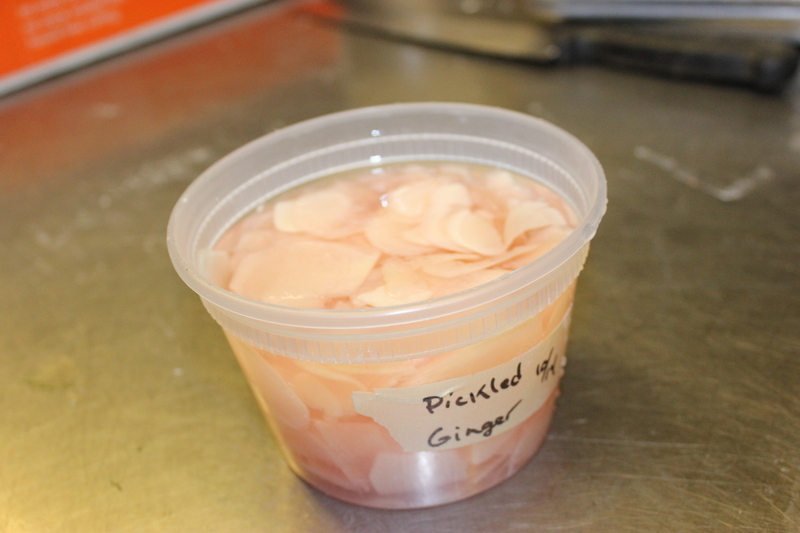 Chef Aaron Park’s pickled ginger, with its natural blush. 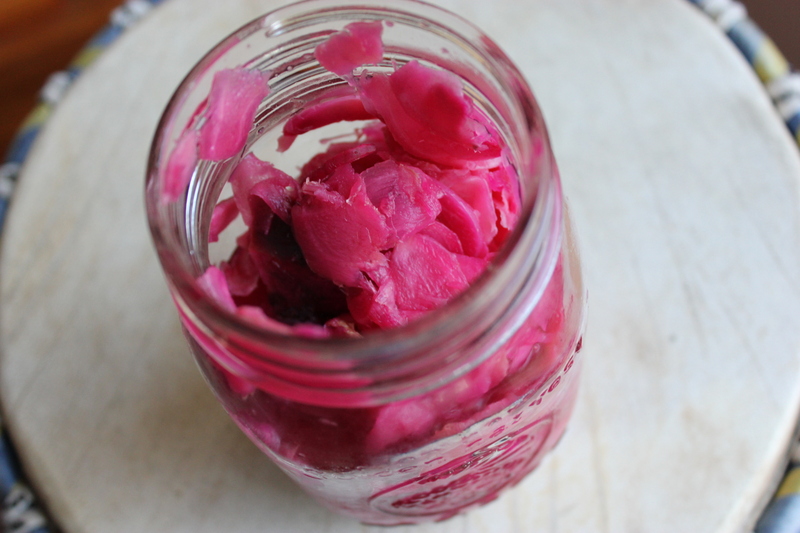 My pickled ginger, its pink amped up with a slice of raw beet. The best thing about young ginger is it doesn’t require the painstaking step of peeling before use. Its pink bud-scales lend pickled ginger its natural pink hue. My former KLCC “Food for Thought” show colleague Jennifer recommends throwing in a slice of raw beet to stain the slices a punchier pink. And here’s a shout-out to my former “Food for Thought” colleagues! Eugene Weekly readers recently voted it their second favorite radio show in town. For pickled ginger recipes, I recommend consulting this one, from my friend Linda Ziedrich, a food preservation guru and cookbook author who homesteads in Scio, Ore. I also drew on the “pickled fresh ginger” recipe from Old Friends Farm in Amherst, Mass., which pioneered the growing of New England ginger back in 2006. Ginger seed supplier East Branch Ginger is another good source of baby ginger recipes. Alas, the fresh ginger season has come to a close. I’m out of product. Next year, I hope to candy my own crystallized ginger. And I’ve always wanted to try naturally-fermented ginger beer. Oregon master bartender Jeffrey Morgenthaler has this recipe. You can even use the gnarled spent mother-roots of the baby ginger to make the “bug,” so nothing goes to waste. 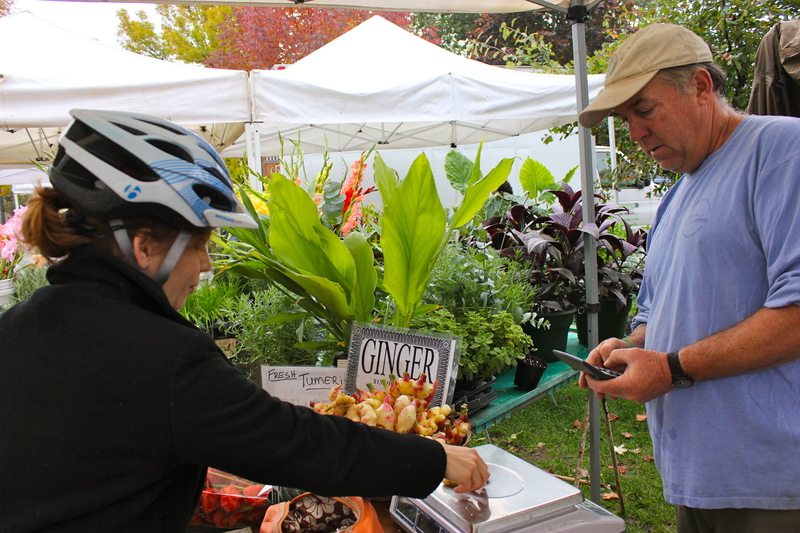 Sara Iams (left) snatches up some fresh ginger from Chas Gill’s Kennebec Flower Farm at the Brunswick Farmers’ Market.